What better time to start teaching children than when they are young? Paul reminds Timothy that he had the privilege of knowing the holy Scriptures ?from infancy? (2 Tim 3:14-15). This is the final part of a syllabus designed for 5-8 year olds ? children in their first few years of school. Children are introduced to the important biblical theme of ?salvation? through key characters (Elijah, Jonah and Paul) and events (the Flood, the Exodus). Children also learn that the message of God's salvation ultimately points to Jesus, the saviour (rescuer) to whom they must personally respond. The syllabus contains eight lessons which clearly explain the gospel in an accessible way, as well as six lessons on living the Christian life. Salvation is also learnt through special Christmas and Easter lessons. Teaching Little Ones - Salvation by Stephanie Carmichael was published by Matthias Media in March 2007 and is our 28777th best seller. 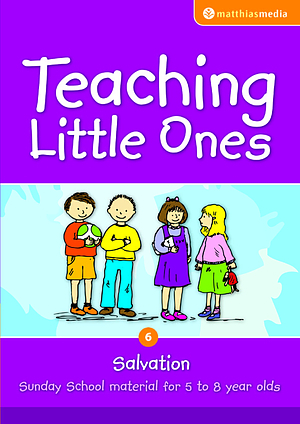 The ISBN for Teaching Little Ones - Salvation is 9781921068676. Be the first to review Teaching Little Ones - Salvation! Got a question? No problem! Just click here to ask us about Teaching Little Ones - Salvation.